A foodie festival has just begun! 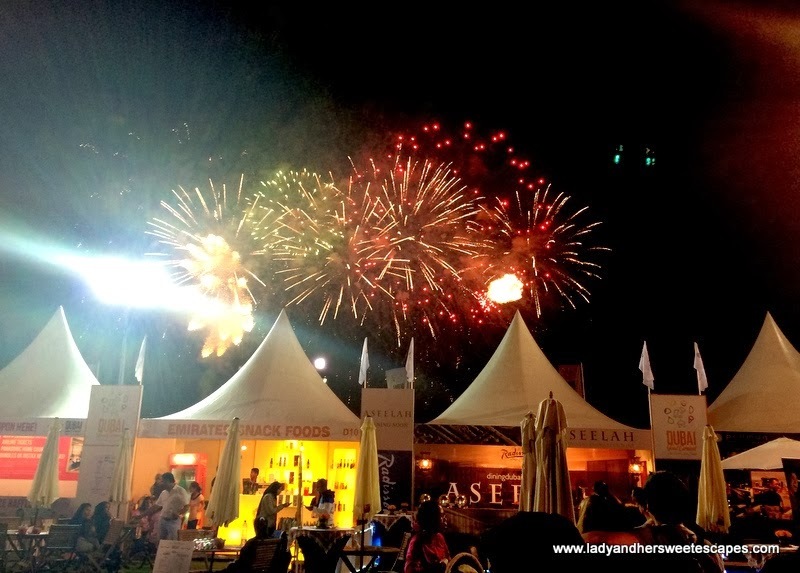 Last weekend, Dubai Food Carnival kicked off the 23-day Dubai Food Festival 2014 with a bang! The newest food, beverage and entertainment extravaganza was on the list of events I shouldn't miss this month, so I was over the moon when I received a media invitation. My blog's official photographer (aka my husband) and I were given passes that we could use any time during the 2-day event. Our initial plan was to spend three hours of our weekend at the carnival, but with so many things to do, so much more to see and so many food to try, Ed and I decided to stay a little longer... until our 3-hour carnival plan turned into an 8-hour foodie getaway! On a sunny weekend of "gastro-tainment", it was just right that we arrived as early birds with empty tummies! The Dubai Food Carnival is a venue where all the flavors of the world come together! Dubai Festival City's open arena was lined with over 100 food and drink stalls; some are my favorites, some are restaurants which I have yet to try. We wandered, checked out every stall and happily nibbled free food samples. I had a freshly prepared gourmet meal at Pullman Hotel's stall for lunch and a delicious "posh fish finger sandwich" from Ghaf Kitchen's 1962 vintage Citroen catering van for dinner. We were in food haven! "What shall we have for lunch?" was a difficult question at Dubai Food Carnival. sampling out Gourmet Burger Kitchen's fries and dips... yum! Ghaf Kitchen's charming vintage catering van serves delicious British food around town! Hotel restaurants have stalls at the carnival too! Wok It served authentic Asian street food at the carnival. Gotta visit their main resto soon! 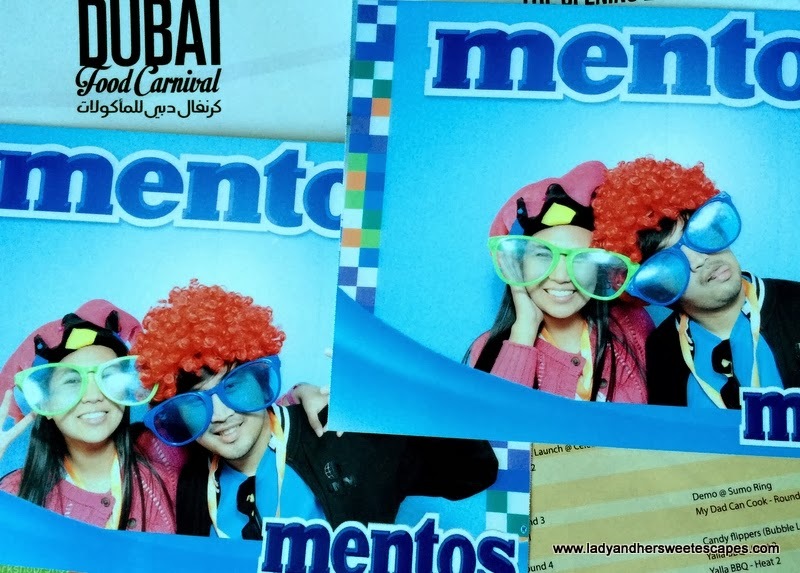 Dubai Food Carnival was a fun-filled family affair! A carnival isn't complete without games and prizes! I won a cuddly bear at Pullman's mini-game! Jugglers and performers entertained the visitors at the seating area. There was never a dull moment! Nawaf of Mandilicious was always ready for photo ops! Dubai Food Carnival offered non-stop world-class entertainment. In between the food tasting and fun games, we comfortably lounged on the bean bags to watch the live shows at the main stage. We were able to catch the very interesting Bloggers' Forum at the 360 stage and Chef Sanjeev Kapoor's cooking demo at the Chef Dome. Like the food selection, the entertainment was very diverse as well. I got to witness a Sumo wrestling match, a Capoeira Mob performance and various cooking showdowns all in one day! Visitors who longed for a cool relaxing vibe went to the Bubbly Lounge to listen to the live acoustic band, while those who wanted a good laugh gathered around the main stage to watch the hilarious stand-up comedians, followed by the upbeat cacophony using kitchen items. A grand 15-minute fireworks display ended our fun-filled day at the carnival. Truly a weekend well-spent! Fret not if you've missed all the fun. There are more Foodie Events in the coming weeks! You can have a Taste of Peru at Madinat Jumeirah from February 26 to March 1, 2014. There's the celebration of meat and music at The Big Grill in Emirates Golf Club on February 28, 2014. The grand food festival, Taste of Dubai in Dubai Media City Amphitheater, returns on March 13 to March 15, 2014. For complete event listing, visit Dubai Food Festival's website here. Wow, a festival for food lovers sounds like my kind of thing! looks like you had an amazing time! Wow, that looks like so much fun! There were even sumo wrestlers?? Now, that is something and I see that you got yourself a teddy bear too! My mouth is literally watery at the sight of that risotto.. yum! It was awesome! Would have been even better if I bumped into you and the rest of BITC at the carnival. Amazing information about Food, Fun and Entertainment at Dubai Food Carnival with awesome pictures. I really like the layout and how information have been presented for the readers. Great effort. I will keep sharing this information to my friends and colleagues. Dubai is emerging as a new hope for adrenaline junkies & holiday makers. It is famous world-wide for opulent hotels, plethora of shopping destinations & ultra-modern architecture. People aspiring to visit this desert marvel can apply for Dubai Visa .